Brilliant pale bright gold color. Bright, creamy, confected fruity sweet aromas of lemon lime sweet tarts, vanilla nougat, mandarin zest, and yellow gummy bears with an lively, spritzy, fruity sweet medium body and a smooth, delightful, relaxed finish with fruit tannins and no oak flavor. 87 • Bodega de San Antonio Sangria 10% (USA) $15.00. 88 • Chocolate Bar NV Chocolate Port, California 18% (USA) $17.00. 83 • Diama Sparkle NV Extra Dry, Prosecco DOC 11.5% (Italy) $16.00. 87 • Diama Sparkle NV Sparkling Rosé, Italy 11.5% (Italy) $16.00. 84 • Fontana Gina 2014 Pinot Grigio, Delle Venezie IGT 12% (Italy) $13.00. 93 • La Quinta NV Syrah Port, Paso Robles 18.5% (USA) $17.00. 93 • Maddalena 2013 Chardonnay, Monterey 14.9% (USA) $15.00. 90 • Maddalena 2014 Pinot Grigio, Monterey 14.1% (USA) $15.00. 90 • Maddalena 2014 Zinfandel, Paso Robles 14.5% (USA) $20.00. 90 • Maddalena 2014 Riesling, Monterey 11% (USA) $11.00. 86 • Maddalena 2014 Moscato, Muscat Canelli, Paso Robles 11% (USA) $13.00. 91 • Maddalena 2014 Chardonnay, Monterey 14.9% (USA) $15.00. 90 • Maddalena 2015 Estate Reserve, Pinot Grigio, Monterey 13.9% (USA) $15.00. 88 • Maddalena 2015 Estate Reserve, Muscat Canelli, Paso Robles 11% (USA) $13.00. 92 • Maddalena 2012 Cabernet Sauvignon, Paso Robles 13.9% (USA) $18.00. 91 • Maddalena 2012 Merlot, Paso Robles 14.5% (USA) $16.00. 88 • Maddalena 2015 Zinfandel, Paso Robles 15.1% (USA) $19.00. 87 • Maddalena 2015 Chardonnay, Monterey 14.9% (USA) $16.00. 88 • Maddalena 2016 Estate Reserve, Pinot Grigio, Monterey 14.1% (USA) $16.00. 88 • Maddalena 2017 Rosee, Paso Robles 12.5% (USA) $22.00. 92 • Maddalena 2016 Zinfandel, Paso Robles 15.1% (USA) $22.00. 89 • Maddalena 2013 Cabernet Sauvignon, Paso Robles 14.1% (USA) $20.00. 87 • Maddalena 2014 Merlot, Paso Robles 14.1% (USA) $18.00. 84 • Maddalena 2015 Estate Reserve, Chardonnay, Monterey 14.9% (USA) $18.00. 93 • Maddalena 2016 Chardonnay, Monterey 14.9% (USA) $18.00. 84 • Maddalena 2016 Semi-Sweet, Riesling, Monterey 11.5% (USA) $16.00. 88 • Maddalena 2015 Cabernet Sauvignon, Paso Robles 13.9% (USA) $24.00. 90 • Opaque 2014 Zinfandel, Paso Robles 15.5% (USA) $30.00. 92 • Opaque 2011 Malbec, Paso Robles 14.5% (USA) $30.00. 88 • Opaque 2011 Petit Verdot, Paso Robles 14.1% (USA) $30.00. 94 • Opaque 2014 Darkness Red Blend, Paso Robles 14.9% (USA) $30.00. 91 • Opaque 2012 Irick Vineyard, Malbec, Paso Robles 14.5% (USA) $30.00. 90 • Opaque 2012 Petit Verdot, Rutherford, Napa Valley 14.5% (USA) $30.00. 89 • Opaque 2015 Darkness Red Blend, Paso Robles 14.9% (USA) $32.00. 92 • Opaque 2015 Zinfandel, Paso Robles 14.9% (USA) $25.00. 92 • Opaque 2013 Malbec, Paso Robles 14.5% (USA) $32.00. 95 • Riboli Family Vineyard 2013 Cabernet Sauvignon, Napa Valley 15.1% (USA) $60.00. 87 • Riboli Family Vineyard 2014 Cabernet Sauvignon, Napa Valley 15.1% (USA) $60.00. 93 • Riboli Family Vineyard 2015 Estate Grown, Cabernet Sauvignon, Rutherford, Napa Valley 14.9% (USA) $65.00. 84 • Rosa 22 Rosé Aperitivo Liqueur 15% (Italy) $24.00. 87 • San Antonio NV Lambrusco, Emilia IGT 7.5% (Italy) $13.00. 93 • San Antonio 2011 Heritage, Other Red, Paso Robles 14.5% (USA) $27.00. 92 • San Antonio 2011 Cask 520, Paso Robles 14.5% (USA) $30.00. 84 • San Antonio NV "Cardinale" Sweet Red Blend, California 11.5% (USA) $8.00. 80 • San Antonio NV "Imperial" Semi-Sweet Red Blend, California 12% (USA) $8.00. 85 • San Antonio NV "Granada" Tropical Sweet Pink, California 11% (USA) $8.00. 86 • San Antonio NV "Villadoro", Moscato, California 12% (USA) $8.00. 80 • San Antonio NV Lambrusco, Italy 7.5% (Italy) $8.00. 91 • San Antonio 2014 Centennial Red Blend, Paso Robles 14.5% (USA) $85.00. 84 • San Antonio NV Cardinale Sweet Red Dessert Wine, California 11.5% (USA) $10.00. 85 • San Antonio NV Granada Tropical Sweet Pink Flavored Wine, California 11% (USA) $10.00. 81 • San Antonio NV Villadoro Moscato, California 12% (USA) $10.00. 83 • San Antonio NV Imperial Semi-Sweet Red Dessert Wine, California 12% (USA) $10.00. 94 • San Simeon 2014 Chardonnay, Monterey 14.9% (USA) $20.00. 91 • San Simeon 2014 Pinot Noir, Monterey 14.9% (USA) $25.00. 92 • San Simeon 2011 Estate Reserve, Syrah, Paso Robles 14.5% (USA) $22.00. 88 • San Simeon 2011 Estate Reserve, Petite Sirah, Paso Robles 13.9% (USA) $22.00. 91 • San Simeon 2013 Stormwatch, Paso Robles 14.5% (USA) $65.00. 90 • San Simeon 2015 Stefano Vineyard Estate Reserve, Viognier, Paso Robles 14.9% (USA) $20.00. 89 • San Simeon 2012 Estate Reserve, Petite Sirah, Paso Robles 14.1% (USA) $22.00. 89 • San Simeon 2013 Estate Reserve, Cabernet Sauvignon, Paso Robles 14.5% (USA) $25.00. 91 • San Simeon 2013 Estate Reserve, Merlot, Paso Robles 14.1% (USA) $20.00. 92 • San Simeon 2015 Estate Reserve, Chardonnay, Monterey 14.9% (USA) $20.00. 91 • San Simeon 2016 Estate Reserve, Sauvignon Blanc, Paso Robles 14.1% (USA) $19.00. 89 • San Simeon 2015 Estate Reserve, Pinot Noir, Monterey 14.9% (USA) $19.00. 95 • San Simeon 2014 Estate Reserve, Cabernet Sauvignon, Paso Robles 14.5% (USA) $27.00. 86 • San Simeon 2016 Stefano Vineyard Estate Reserve, Viognier, Paso Robles 14.9% (USA) $20.00. 92 • San Simeon 2012 Estate Reserve, Syrah, Paso Robles 14.9% (USA) $22.00. 89 • San Simeon 2014 Estate Reserve, Merlot, Paso Robles 13.9% (USA) $20.00. 91 • San Simeon 2014 Stormwatch Estate Reserve, Paso Robles 14.5% (USA) $70.00. 85 • San Simeon 2017 Estate Reserve, Sauvignon Blanc, Paso Robles 13.9% (USA) $22.00. 86 • San Simeon 2017 Stefano Vineyard Rosé, Grenache, Paso Robles 14.1% (USA) $22.00. 95 • San Simeon 2016 Estate Reserve, Pinot Noir, Monterey 14.9% (USA) $22.00. 95 • San Simeon 2014 Petite Sirah, Paso Robles 14.5% (USA) $25.00. 89 • San Simeon 2015 Estate Reserve, Cabernet Sauvignon, Paso Robles 14.5% (USA) $28.00. 91 • San Simeon 2017 Viognier, Paso Robles 14.5% (USA) $22.00. 93 • San Simeon 2017 Estate Reserve, Pinot Noir, Monterey 14.5% (USA) $22.00. 89 • San Simeon 2017 Stefano Vineyard, Viognier, Paso Robles 14.5% (USA) $22.00. 89 • San Simeon 2014 Estate Reserve, Syrah, Paso Robles 14.5% (USA) $24.00. 89 • San Simeon 2015 Stormwatch Estate Reserve Red Blend, Paso Robles 14.5% (USA) $50.00. 93 • San Simeon 2018 Estate Reserve, Sauvignon Blanc, Paso Robles 13.9% (USA) $28.00. 89 • San Simeon 2015 Estate Reserve, Merlot, Paso Robles 14.5% (USA) $28.00. 94 • Santo Stefano NV Lambrusco, Italy 8% (Italy) $8.00. 89 • Santo Stefano 2012 Estate Grown, Cabernet Sauvignon, Rutherford, Napa Valley 14.5% (USA) $25.00. 85 • Stella Rosa NV Semi-Sweet, Moscato, Italy 5% (Italy) $12.00. 88 • Stella Rosa NV "Stella Pink" Semi-Sweet Sparkling Wine, Italy 5% (Italy) $9.00. 89 • Stella Rosa NV "Stella Berry" Semi-Sweet Sparkling Wine, Italy 5% (Italy) $9.00. 91 • Stella Rosa NV "Stella Peach" Semi-Sweet Sparkling Wine, Italy 5% (Italy) $9.00. 89 • Stella Rosa NV "Red" Semi-Sweet Sparkling Wine, Italy 5% (Italy) $12.00. 87 • Stella Rosa NV "Platinum" Semi-Sweet Sparkling Wine, Italy 5% (Italy) $15.00. 80 • Stella Rosa NV Extra Dry, Prosecco DOC 11% (Italy) $15.00. 89 • Stella Rosa NV Imperiale Extra Dry, Prosecco DOC 11% (Italy) $15.00. 87 • Stella Rosa NV Imperiale Made With Organic Grapes, Prosecco DOC 11% (Italy) $15.00. 92 • Stella Rosa NV Rosé, Moscato, Italy 9.5% (Italy) $15.00. 87 • Stella Rosa NV Berry Semi-Sweet Sparkling , Italy 5% (Italy) $9.00. 83 • Stella Rosa NV Pink Semi-Sweet Sparkling , Italy 5% (Italy) $9.00. 90 • Stella Rosa NV Red Semi-Sweet Sparkling , Italy 5% (Italy) $12.00. 87 • Stella Rosa NV Rosso Semi-Sweet Wine, Italy 5.5% (Italy) $12.00. 81 • Stella Rosa NV Bianco Semi-Sweet Wine, Italy 5% (Italy) $9.00. 81 • Stella Rosa NV Sparkling Sweet, Moscato, Italy 5.5% (Italy) $12.00. 88 • Stella Rosa NV Moscato d’Asti DOCG 5.5% (Italy) $12.00. 92 • Stella Rosa NV Brachetto d’Acqui DOCG 6% (Italy) $15.00. 88 • Stella Rosa NV Sparkling Moscato d’Orange, Italy 6% (Italy) $15.00. 86 • Stella Rosa NV Imperiale Sparkling Orange Moscato, Fior d’Arancio Colli Euganei DOCG 6% (Italy) $15.00. 90 • Stella Rosa NV L’Originale Rosso, Italy 5.5% (Italy) $12.00. 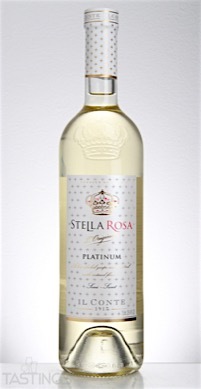 89 • Stella Rosa NV L’Originale Platinum, Italy 5.5% (Italy) $15.00. 85 • Stella Rosa NV L’Originale Pink, Italy 5% (Italy) $9.00. 88 • Stella Rosa NV Imperiale Black Lux Sparkling Wine, Italy 6.5% (Italy) $18.00. 91 • Stella Rosa NV Rosso Lux Demi-Sweet Sparkling, Italy 6.5% (Italy) $18.00. 88 • Stella Rosa NV Gold, Italy 10% (Italy) $14.00. 85 • Stella Rosa NV Semi-Sweet Berry, Italy 5.5% (Italy) $9.00. 85 • Stella Rosa NV Semi-Sweet, Moscato d’Asti 12% (Italy) $12.00. 86 • Stella Rosa NV Extra Dry, Prosecco 11% (Italy) $16.00. 83 • Stella Rosa NV Red Reserve Semi-Sweet, Italy 5% (Italy) $14.00. 89 • Stella Rosa NV Black Lux Imperiale Semi-Sweet Sparkling, Italy 6.5% (Italy) $18.00. 86 • Stella Rosa NV L’Originale Semi-Sweet Pink, Italy 5% (Italy) $9.00. 84 • Stella Rosa NV L’Originale Semi-Sweet Platinum, Italy 5.5% (Italy) $15.00. 84 • Stella Rosa NV Moscato Orange, Fior d’Arancio Colli Euganei DOCG 6% (Italy) $15.00. 83 • Stella Rosa NV Gold Semi-Sweet Wine, Italy 5.5% (Italy) $14.00. 83 • Stella Rosa NV Berry Semi-Sweet Sparkling , Italy 5.5% (Italy) $9.00. 86 • Stella Rosa NV Moscato d’Asti 5.5% (Italy) $12.00. 88 • Stella Rosa NV Rosé Wine Specialty 6.5% (Italy) $14.00. 86 • Stella Rosa NV Stella Pink Wine Specialty 5% (Italy) $12.00. 90 • Stella Rosa NV Red Apple Flavored Wine, Italy 5% (Italy) $12.00. 88 • Stella Rosa NV Green Apple Flavored Wine, Italy 5% (Italy) $12.00. 90 • Stella Rosa NV Tropical Mango Flavored Wine, Italy 5% (Italy) $12.00. 87 • Stella Rosa NV Platinum Flavored Wine, Italy 5% (Italy) $12.00. 83 • Stella Rosa NV Rosé Flavored Wine, Italy 6.5% (Italy) $14.00. 84 • Stella Rosa NV Pink Flavored Wine, Italy 5% (Italy) $12.00. 90 • Stella Rosa NV Moscato d’Asti 5.5% (Italy) $12.00. 88 • Stella Rosa NV Berry Flavored Wine, Italy 5% (Italy) $12.00. 84 • Stella Rosa NV Pearl Lux Sparkling, Italy 11% (Italy) $20.00. 84 • Stella Rosa NV Extra Dry Prosecco, Chardonnay, Italy 11% (Italy) $18.00. 88 • Stella Rosa NV Pearl Lux Sparkling, Italy 11% (Italy) $22.00. 84 • Stella Rosa NV Green Apple Flavored Wine, Italy 5% (Italy) $12.00. 87 • Stella Rosa NV Ruby Rosé Grapefruit Sparkling Flavored Wine, Italy 5% (Italy) $14.00. 84 • The Champion NV Il Campione, Chardonnay, South-Eastern Australia 13.5% (Australia) $12.00. 89 • Three Pines 2012 "Black Granite" Red Blend, California 13.9% (USA) $13.00. 90 • Three Pines 2012 "Tierra Roja", Cabernet Sauvignon, California 13.9% (USA) $13.00. 88 • Three Pines 2013 "Tierra Roja", Cabernet Sauvignon, California 14.1% (USA) $13.00. 82 • Villa Alena 2014 Pinot Grigio, Delle Venezie IGT 12% (Italy) $13.00. 85 • Villa Alena 2014 Pinot Grigio, Italy 12% (Italy) $13.00. 92 • Windstream 2013 Sarmento Vineyard, Chardonnay, Santa Lucia Highlands 15.1% (USA) $25.00. Sparkling Dessert Wines are effervescent sweet fruity wines with residual sugar levels of 5% brix or higher that are not from established sparkling dessert wine categories like Italian Moscato d' Asti or Canadian Sparkling Ice Wines. American examples are usually made with a variety of muscat grapes, labeled as 'Moscato", and may include other natural flavors like citrus or berries. Stella Rosa NV "Platinum" Semi-Sweet Sparkling Wine, Italy rating was calculated by tastings.com to be 87 points out of 100 on 3/3/2016. Please note that MSRP may have changed since the date of our review.